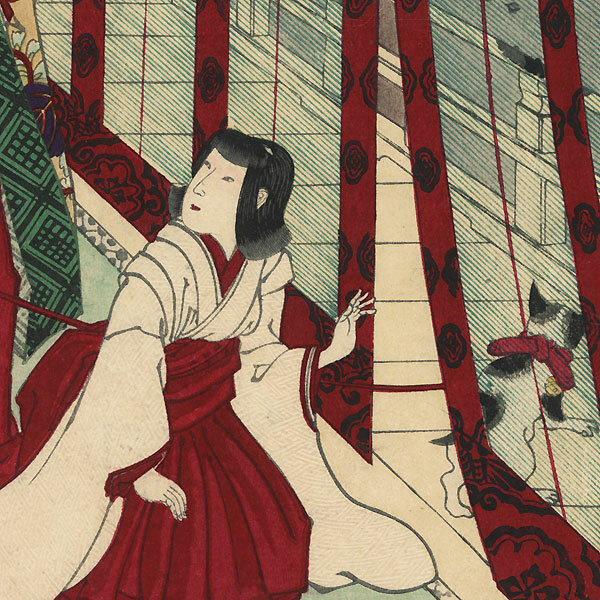 Yamashiro, Flowers of Ouchi, the Third Princess, No. 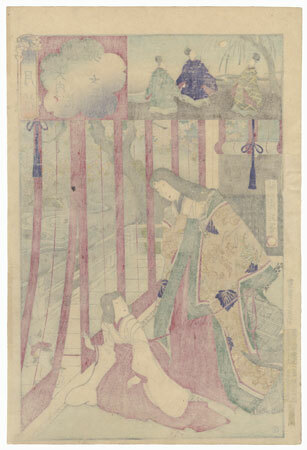 27 - Handsome scene from the famous "Tale of Genji," showing the Third Princess, the wife of Prince Genji, in her private quarters. She stands at the edge of the verandah, peering through fine bamboo blinds at some courtiers playing kickball in the courtyard. She was supposed to stay hidden from view, but her curious kitten has wandered out on the verandah, opening the blinds long enough for the young Kashiwagi to see the princess and fall madly in love. The inset above shows the courtiers playing kickball under a willow tree. Incredibly fine line work in the bamboo blinds, and lovely embossing on the white kimono fabric. A charming image from this classic tale. Condition - This print with excellent color and detail as shown. Slight thinning and tiny loss at edge, repaired. Please see photos for details. Nice overall.